** FREE POSTAGE within Australia, postage overseas at cost -- Note: Postage will be added automatically when you place an order, but I will adjust the postage cost when the order is processed. ** These two delightful volumes chronicle the military life of Frederick the Great. Originally in a single volume, this work was published in 1895 and was a collaboration between two of Germany’s greatest military artists; Richard Knötel and Carl Röchling. The former was famous for his Uniformenkunde; the eighteen volume set of more that one thousand illustrations of the worlds uniforms. Carl Röchling was a member of the Berlin Academy of Art and was well known for his panoramic paintings of famous Prussian battles such as his scenes from the Battle of Leuthen (1757) and the Battle of Sedan (1870). His series on the Franco-Prussian War remains his greatest legacy. "Der Alte Fritz in 50 Bildern für Jung und Alt" was a children’s book produced in a style very typical for its era. A scene from most of Frederick’s battles are illustrated, including Mollwitz, Hohenfreidburg, Leuthen, Rossbach and Hochkirk. The scenes are mostly whimsical as is appropriate for publications aimed at children but the depictions are reasonably accurate. Any collector of illustrations and ephemera from the eighteenth century will enjoy these books. 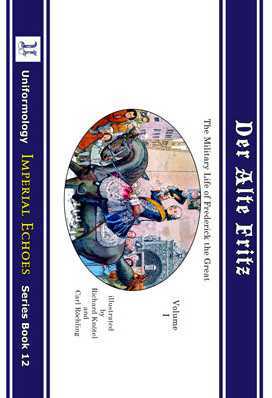 Volume 1 covers his younger life to the early Seven Years War and Volume 2 until his death. Each volume has 21 plates.